When a child with Pyruvate Kinase Deficiency is born, it will probably develop sever jaundice. The reason for treating the Jaundice is that too much bilirubin in a a small body can be very dangerous. It can cause brain damage, which of course needs to be limited as soon as possible. The first choice of treatment will be phototherapy. 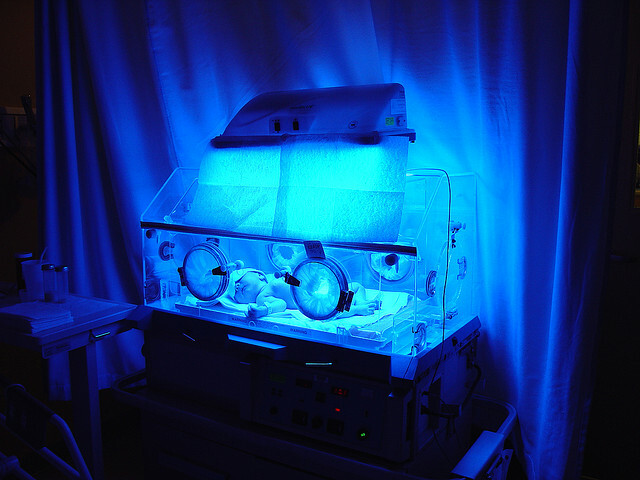 This means that the child will be put under a blue light that is known for the effect that it helps the body to get rid of the bilirubin faster. While most of the time, the diagnosis is not even made before this treatment is given, the high amount of bilirubin will most definitely give a strong indication for such a treatment. Since Jaundice in Adults is not dangerous, lots of doctors will not prescribe anything to treat it. However, the color of the skin is a very important issue in someone’s psychological wellbeing. When an Adult keeps being very jaundice, phototherapy and exchange therapy is prescribed by some doctors. Even if there is nog strong indication that these treatments are still effective. Some persons with PKD that tried phototherapy even said that their skin became orange by the treatment. The most effective way to treat jaundice with adults, is giving regular transfusions. It seems that regular transfusions will have a direct effect on the bonemarrow and the haemolysis of the blood. When the jaundice is too severe and the amount of bilirubin is too high, it might be an idea to check whether the person has Gilbert’s syndrome. This is a genetic disorder that makes the body less able to get rid of bilirubin. It is a commons syndrome, which is often not diagnosed because of the lack of symptoms. In the case of the combination with Pyruvate Kinase Deficiency, the symptoms become more evident.